Here are some of the things I have made so far on the run up to the Easter break. None of the traditional simnel cake or hot cross buns from me due to my dislike of orange peel and marzipan. 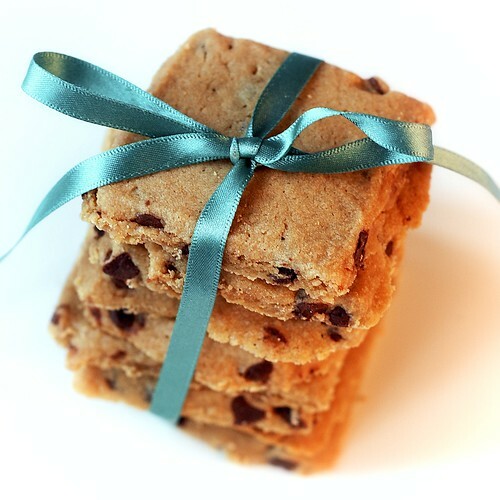 This Espresso and choc chip shortbread that I spotted on ‘Use Real Butter‘ via FoodGawker is delicious, the recipe for these is here. I won’t retype it as Jen does a fabulous job of describing the process. For UK readers if you want to try the recipe use icing sugar where it states confectioners sugar, and medium resealable sandwich bags are about the right size. Oh, and I couldn’t find espresso powder so used coffee granules, use slightly less than a tablespoon. And then I did this lot for the School Spring Fair. 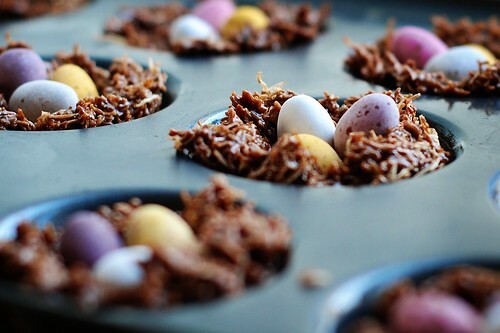 The ubiquitous Easter nests, that I make with melted Mars bars and a bit of syrup and butter then mix with crushed Shredded Wheat. I will write about the cake pops in the next day or two as they are so cute they deserve a post of their own! 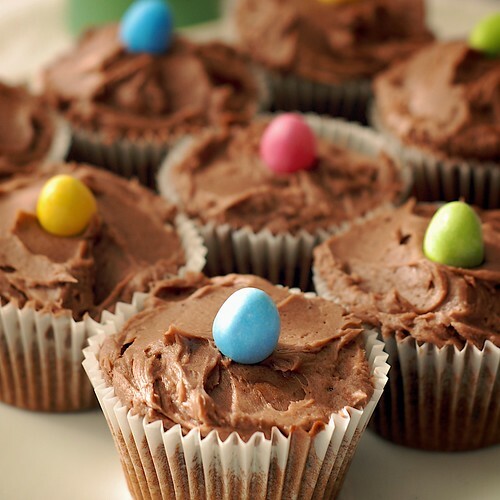 I have just noticed that people are Google searching for recipes for these so you can find my orange cupcake recipe here. For the basic buns above I just whisk up 125g sugar and 125g butter until light. Then I add 2 eggs, 125g flour and a dash of vanilla and 2 tblsp of milk and whisk the bejesus out of it. Then bake for 15 minutes in 12 cupcake cases at 180 degrees. For chocolate flavour ones I add 2 oz of cocoa and a bit less flour. (For Ed I sprinkle in some sultanas and cherries) The buttercream for the topping is 4oz butter, 8oz icing sugar and whisk lots and perhaps add a dash of milk to slacken it plus some flavouring or some cocoa. Fantastic batch of baking there. I haven’t thought about making Easter nests with Mars bars. I’m looking forward to seeing the cake pops. Melted Mars Bars = Good, just don’t let it boil or you break your teeth. Note how only one of the cakes is piped, I still only have disposable piping bags and I had a blow out, so had to resort to spatulation! 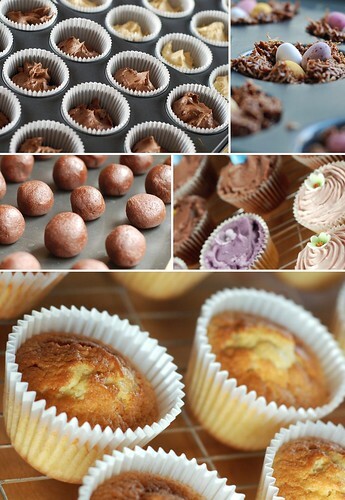 All looks great, love look of the espresso choc chip recipe! What absolutely beautiful images. 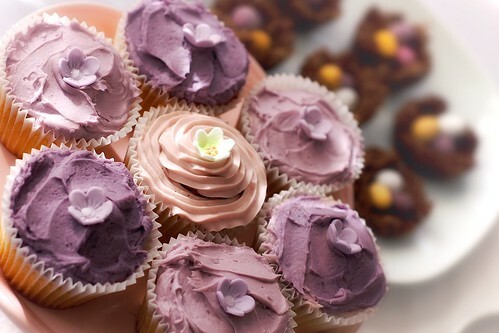 Have to make a volume of cupcakes for a charity coffee morning next month and I’m particularly inspired by the shades of violet. My, you’ve been busy. I love the look of that shortbread. Love everything, I don’t know what to make first they all look so yummy! What kind of syrup do you use in your Easter nest and how much butter? Hi Susan, I use about 4 Mars bars and 2 tbsp/ounces of Golden Syrup and 3 tbsp/ounces of butter but it’s not a precise science. Don’t let it boil or it turns to toffee.